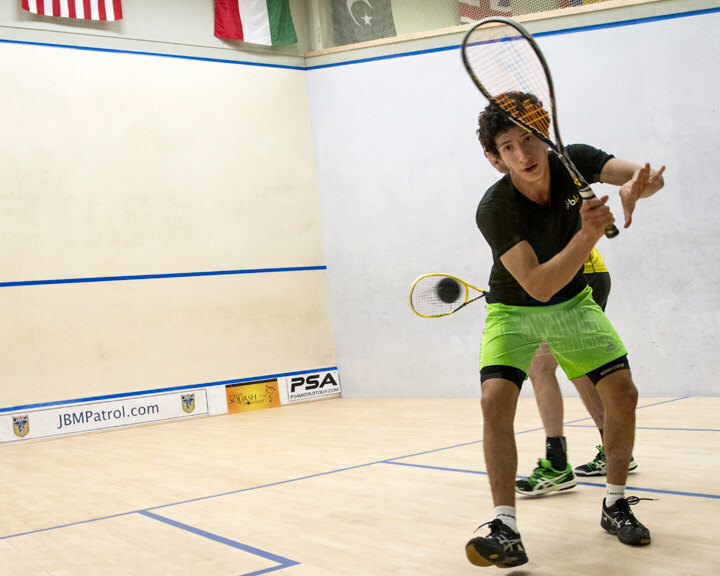 A PACKED house of Madison squash fans were treated to an excellent match today between a young up-and-comer and a battle-tested veteran. Our top seed Piedro Schweertman survived two tough, five-gamers in the past two days, and many of us were wondering if he was going to have the legs and mental stamina to take on the youngster from Mexico, Jesus Camacho, who hadn’t lost a set all weekend. The first game was no indication how this match was going to go. It started even for a few points when Camacho ran off 4 in row to go up 5-3. Schweertman steadied the ship and brought one back, but then Camacho ran off 6 in a row to take the game in 10 minutes. Second game started the same. Back and forth for a bit, then Camacho, using his extraordinary retrieving and deft touch to the front left, took the game 11-7. Third game felt a little different. Schweertman, playing confidently, started moving the Mexican from corner to corner, before slotting in some lovely winners of his own. It seemed that Schweertman was back in it at 9-6, but then Camacho ran off 4 points in row to gain his first match ball. Schweertman, with his shirt emblazoned with “Iceman,” showed what he was made of and took control back and won 12-10. I digress. The crowd is sure that Piedro has this game sewn up. Not so. Camacho storms back to tie it at 8 all. Un-phased, Piedro closes it out at 11-8. On to the fifth. This one was going to be tight the entire game, and we all knew it. Pretty much back and forth up to 7 all. Long rallies. Some gamesmanship from Camacho taking way too much time between points where he was given a conduct warning by Referee Daniel Greco. 8 all. 9 all. More gamesmanship. More stalling. More unhappy looks up to the ref. Schweertman has a few games up his sleeve as well and wipes his hand on the wall right as Camacho starts to serve. Nasty look to the ref. Ref is nonplussed. When play resumes, the Dutchman gets a match ball at 10-9. Camacho brings it back to tie it at 10, then goes to 11 for his second match ball. Piedro ties it. Camacho gets another point to get his 3rd match ball. 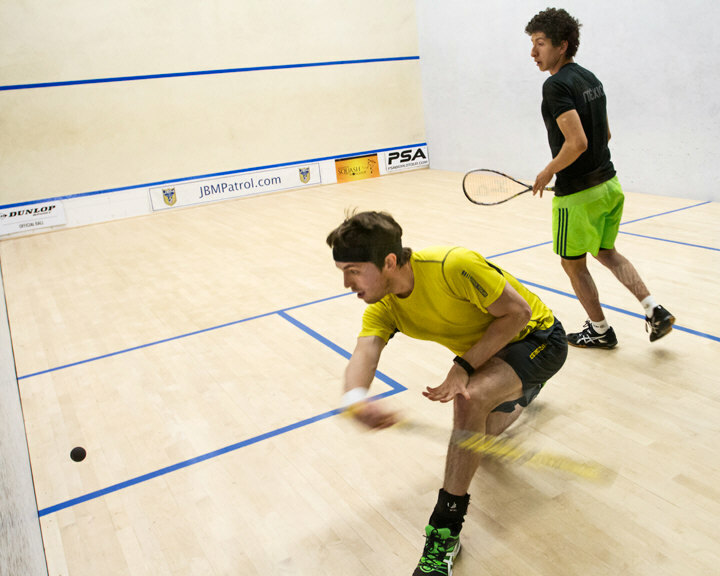 With the next point, Camacho finally closes it out with a great win after 90 minutes of exhilarating squash. Well done to both players for an excellent tournament. Congratulations to Jesus for the win. 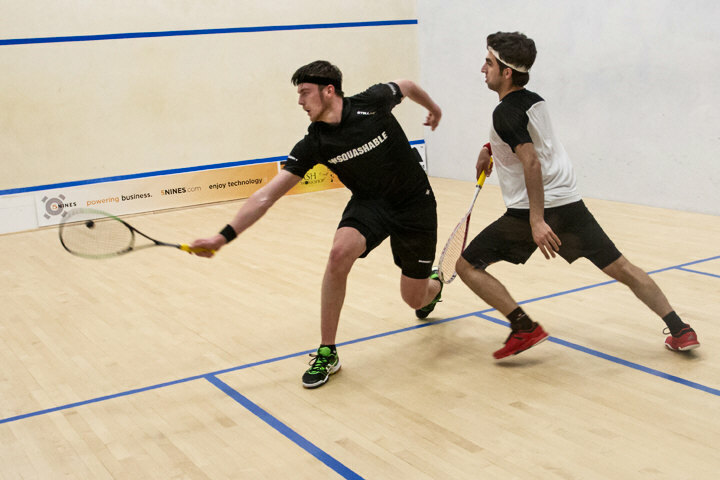 For the second day in a row top seed Piedro Schweertman ground out a five game win in a spectacular display of will. After losing the first, he refocused to win the second. In the third game, the very athletic Patrick Rooney ran down more balls the Piedro could hit and took it 11-6. The fourth and fifth, the big Dutchman changed the tempo and held the ball enough to force Rooney into some errors and just wore him down. It was a great effort by Rooney. 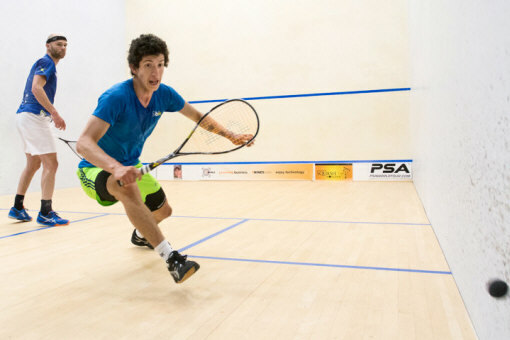 Afterwards, Pierdro said that he wished that he was playing that well at 19 years old and that Patrick has a great future ahead of him. 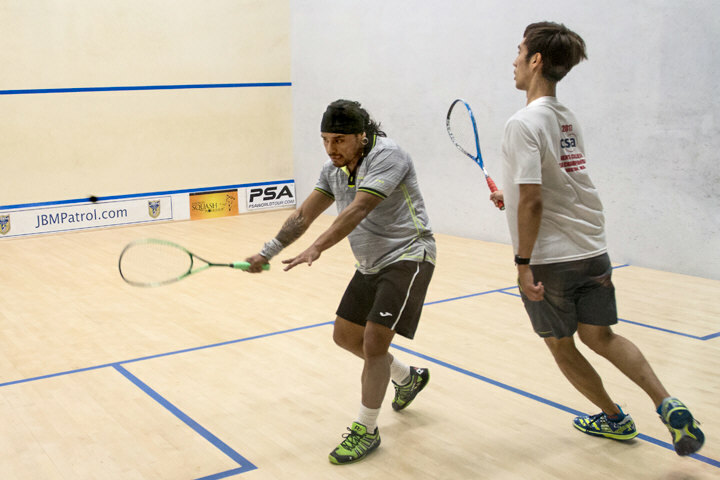 On Thursday, Jesus Camacho beat Chris Fuller, the #5 seed. On Friday he beat the 3 seed. 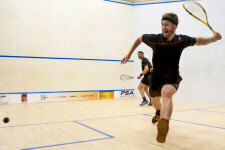 Today, he beat the 2 seed, Chris Hanson, in a fantastic match. The general feeling in the crowd was how very intense it was. Hanson’s accuracy and pressure is exceptionally relentless, and he’d been going through his matches with precision shot-making and intelligent use of weight and variety. The young Mexican though is an exceptional athlete and was able to absorb the pressure until it finally cracked Hanson’s resolve in the 3rd game. 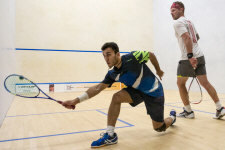 The first two games could have gone either way, with Camacho eking out the first at 11-9, and the second 12-10. At that point, knowing the hill he had to climb, weakened the US National Champion’s resolve enough that Camacho was able to finish out the match in without losing at set. In fact, Camacho hasn’t lost a single set all weekend. What do we have in store for tomorrow? 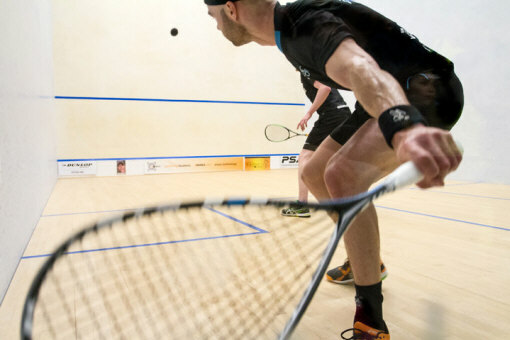 The Madison Open 2017 began with what promised to be a long match, the steady Chris Fuller from England against the speedy Mexican Jesus Camacho. Jesus has had a few good results lately and taken out some players ranked higher than him, and tonight he did it again. 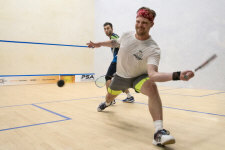 The matches started out with some grueling points, many lasting well over 50 hits, Jesus seems to have the upper hand with some very nice drop shots to finish of the points. Jesus takes the first game after 18-minutes of play. Second game Jesus has a bit of a dip in concentration, with too many mistakes and way to much talking with the referee, Chris takes the game, but again after 18min of play. The third game begins with a few too many let's, due to some traffic issues on Jesus' clearing, but he still young so he'll get over that one day- I hope! After a few points he seems to regroup and again finds some beautiful winners in the front. Fourth game is a copy of the third game and after well over an hour play, Jesus takes another scalp and books his place in the quarters. On center court, played with live streaming and commentating all weekend, first seed Dutchman Piedro Schweertman took on the Scott, Jon Geekie. Piedro has been looking strong in practice all week and was not up for any fooling around- 11-0 11-3 11-0 to Piedro. To Jon's defense, coaching tons and not playing much, doesn't make it easier. Piedro is looking real solid and in my books is looking like he might live up to his 1 seed position this week. 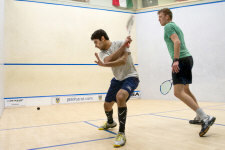 Patrick Rooney and Danish Khan was up next, and the crowd was treated to some nice squash. Danish has been to Madison a few times now, and the crowd has come to like his beautiful hits and smooth movement. 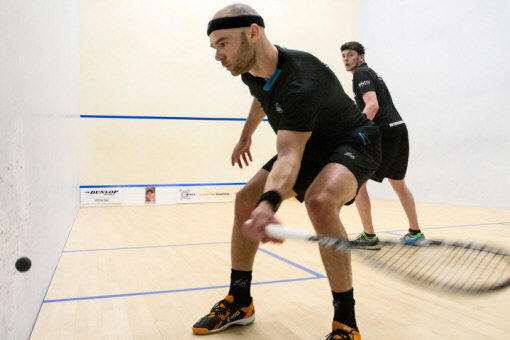 But today Patrick was too strong and took the match 3-0, Patrick will play Anthony Graham who beat Conner Sheen in 3. 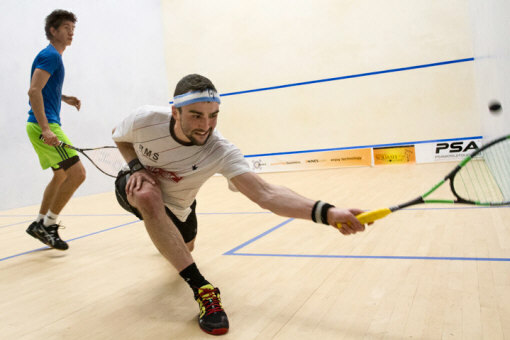 Anthony is looking like he is really enjoying his squash at the moment and it'll be interesting to see how he'll do against the 4th seed in the quarter. 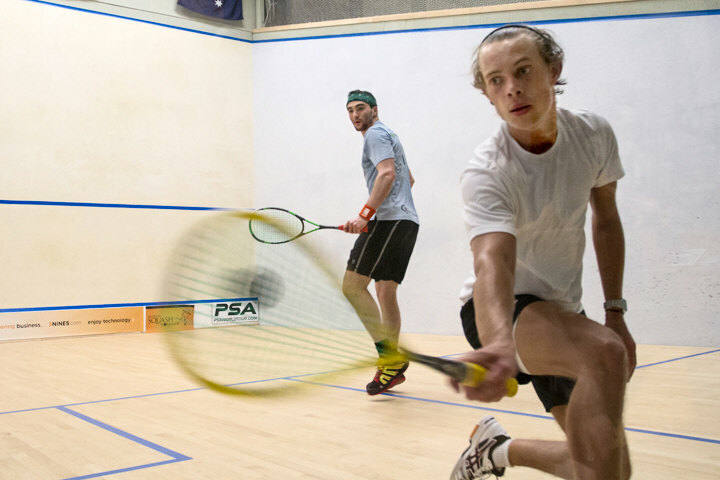 Next up on center court was Madison Squash Workshop's own Head Pro Jonas Knigge Laursen, who after a few years (5) off the tour, has decided to give it a last go at playing some tournaments again. He was up against the always quick and dangerous Shahjahan Khan. The match started out with a some close rallies and the two followed each point for point until around 5 all, Shah then took a little lead and Jonas wasn't able to catch up- a well played first game 11-8 to Shah. 2nd game Jonas was getting frustrated with the clearing of Shah, who seems to get in the way a little too often when Jonas moved in to his forehand side (Jonas is a lefty) and it was causing all sorts of troubles. Anyways, Shah takes the second 11-5. Third game was the best played game from both players. 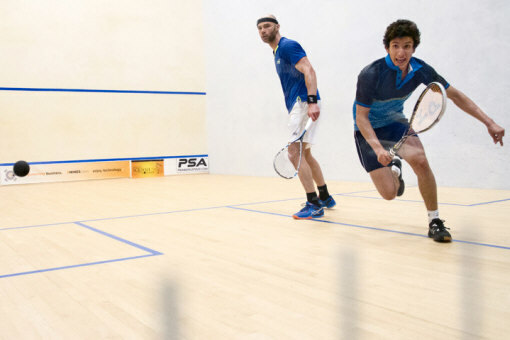 Again following each other point by point to around mid-game, Jonas with winners from his trademark hold cross court and aggressive volley drops and Shah taking a good portion of his points on some beautiful counter drops. 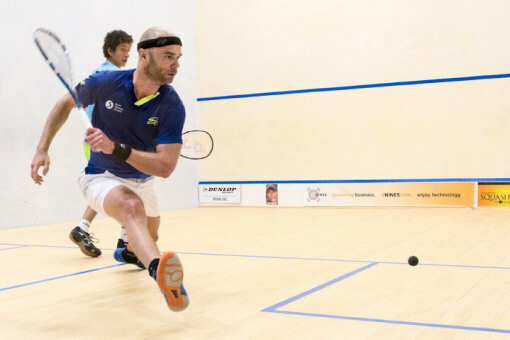 Shah gets ahead at the end, but Jonas is giving it a big push to get back and takes a few points in a row, only to see the ball pass him on a well struck crosscourt from Shah. The crowd was really into this match and especially our always loud club member and tournament patron Mike Ryan, was doing his best to cheer Jonas on the whole way. Shah takes on Jesus Camacho tomorrow, in what I predict to be a long match, but possible with yet another upset from the Mexican. The next two matches saw two Americans against two Englishman, with both US boys coming out on top. 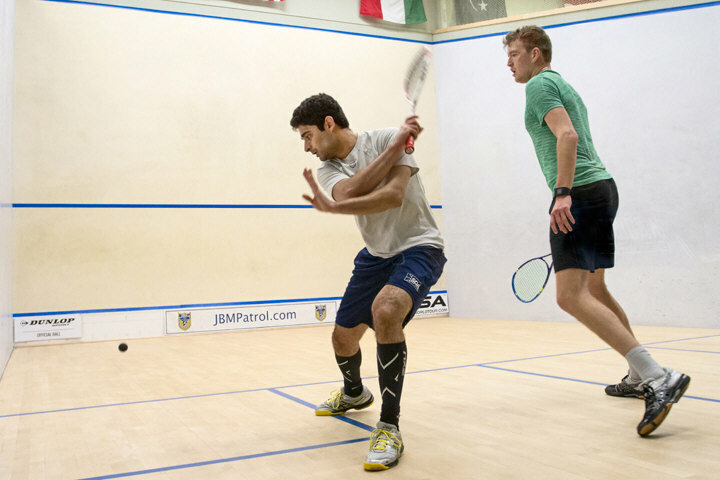 I didn't get to watch the Faraz Khan vs Mark Broekman match, but the crowd seemed to like it, and I'm sure it was played in fair style, with two really nice boys on court. 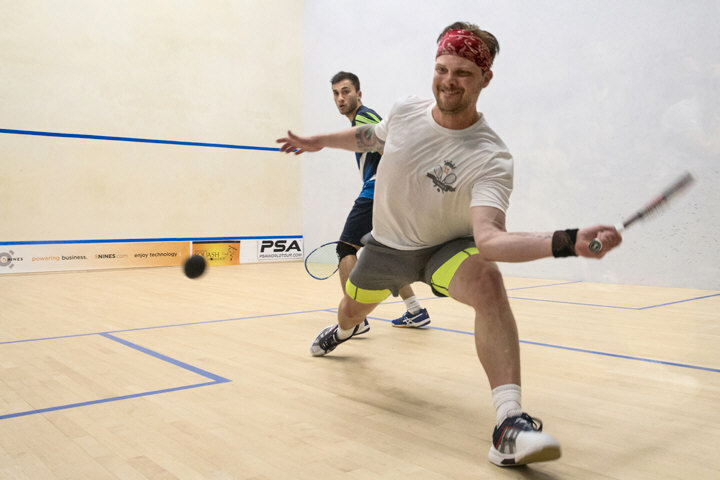 Chris Hanson took on Alex Noakes, and won 3-0, but it wasn't all just smooth wind in the sails for the American, who had to save several game balls in the second before winning it 15-13. Noakes has been to Madison now a few times, and it's been great to see how he has improved each time. A very fair-played match. The two American friends will now meet in the quarters. Last match was Mexican veteran Eric Gálvez vs Koreas Hojung Kim, the veteran proved too strong for the rookie, but Hojung put up a good fight and can be happy with some good points that will see him shoot up the rankings next month. Eric takes on Piedro, in a match that I do not want to miss.